For the therapy platform we started with three 12" wide pine boards. The dimensions can be modified to suit your needs. We made the platform base about four feet long, and the upright ends about 3 feet high. Glue and nail the upright end boards to the bottom board, then use "L" brackets to brace and reinforce the upright ends. Then we found that the bird would get to swinging around and would hit his feet on the sides on the 12" wide bottom. So we took a piece of particle board that was about four feet long and three feet wide and screwed it on top of the bottom board of the platform. To simplify this you could just attach the end boards to the particle board or to a piece of plywood and eliminate the bottom pine board. (See dotted lines on illustration.) This thing evolved as we went along. We put a rubber mat on the top of the particle board so that the bird could get traction, and it was easier on his feet. Then we drilled holes in the upright end boards near the tops and inserted a 3/8" steel rod. We clamped the rod inside and outside the boards with "C" clamps so that the rod could not spin. We found that we needed "stops" on the rod about eight inches from the end boards, to stop the bird from hitting the boards and damaging his wings. We used tightly wrapped string as "stops". Then we put a nylon "clothes line" type pulley on the rod. I call my harness design "The Flying Frog" because when it is laid down flat, that’s what the outline reminds me of. Please see the following illustration. 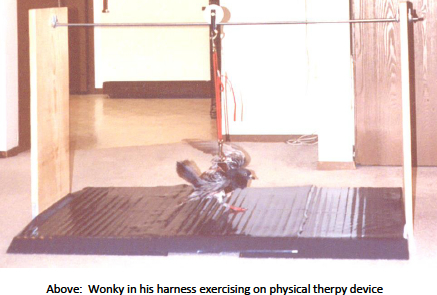 Wonky’s harness was 9 inches long by 7 ½ inches wide when laid out flat. Of course the size can be easily modified for other birds. I made a "pattern" by drawing on a piece of paper towel and cutting it out; it was flexible and could be held up to the bird to check for size. You could also cut out a pattern using something like a white plastic bag, crepe paper, etc. It is probably more of a "sling" than a harness. I spent many hours thinking this thing up. I have put harnesses on dogs, cats and horses, but working around the anatomy of a bird with its wings, crop and keel is a different ball game altogether. I wanted it to be sturdy, flexible and easy to put on the bird with minimal fuss. The material needs to be soft enough not to cause pressure points or sores. You also need to use something that doesn’t ruffle his feathers – keep the feathers smoothed the right way. When feathers are turned the wrong way it is uncomfortable for a bird. We used soft, thin, pliable leather, which is easy to trim as needed to custom fit to the bird. It is also durable and easy to clean. Put the smooth side toward the bird; this causes the least mussing of feathers. As vegans, we avoid using animal products, but I couldn’t come up with anything more practical than leather at the time. Other materials such as blanket flannel, quilted satin or padded nylon might work if you are clever with a sewing machine (I’m not!). Whatever you create, keep in mind that it needs to be strong and reliable – you don’t want the bird to fall and endure further injury. For the "down" (walking) position I used a nylon "cat harness" as a strap, with a buckle and several holes for adjusting height, with swivel snaps on each end. The swivel snaps rotate 360 degrees so the bird may move at will in any direction. For the "up" (flying) position you can hook two swivel snaps together with a metal ring (such as a key ring). Or if you can find one, use one double-headed swivel that has a snap on both ends. See following illustration. Lay the harness down flat with the smooth side up. Bring the left front strap up over the back (in front of the wing and leg) and drop slot 2 over the ring. Bring the right rear strap up over the back (behind wing and leg) and drop slot 3 over the ring. While pinching all four straps together, hold onto the ring.